There are a lot of funny women in Netflix's Wine Country, assembled together by Amy Poehler who is herself a very funny lady. She may be even funnier when she's drunk and hanging out with a bunch of her SNL castmates. At least it certainly looks that way in the movie's first trailer, so pour yourself some rosé and enjoy. Poehler makes her directorial debut with Wine Country, and naturally she's brought along her friends for the ride. Her partner-in-crime Tina Fey is there, of course, along with Rachel Dratch, Ana Gasteyer, Paula Pell, Maya Rudolph, co-writer Emily Spivey, Cherry Jones, and Maya Erskine. Jason Schwartzman is here, too. 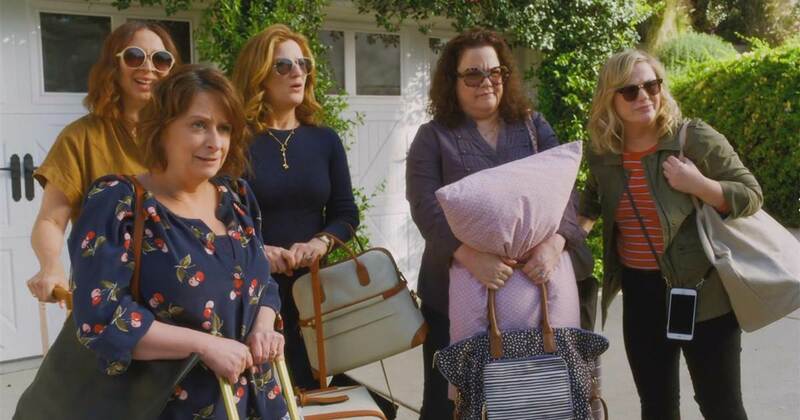 In honor of Rebecca (Rachel Dratch)’s 50th birthday, Abby (Amy Poehler) plans a scenic Napa getaway with their best, longtime friends. Workaholic Catherine (Ana Gasteyer), post-op Val (Paula Pell), homebody Jenny (Emily Spivey), and weary mom Naomi (Maya Rudolph) are equally sold on the chance to relax and reconnect. Yet as the alcohol flows, real-world uncertainties intrude on the punchlines and gossip, and the women begin questioning their friendships and futures. A hilarious and heartfelt comedy directed by Poehler, Wine Country co-stars Tina Fey, Jason Schwartzman, and Cherry Jones. Wine Country hits Netflix on May 10th but will get an exclusive theatrical run on May 8th.